The Brand NEW HOTT Style for our 2D Backpacks. Enjoy a boxier style backpack in 4 different colors! Grab it on SALE now! Backpack is very beautiful! The pink on the backpack looks just like the picture. I had a failed shipping attempt but the shipping was pretty fast. 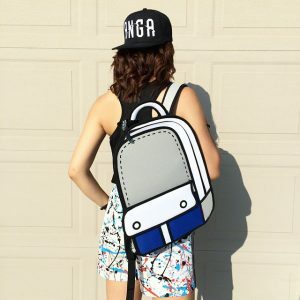 The Hottest Boxiest Style for our 2D Backpacks. Enjoy a refreshing modern look for our 2D Backpack line with royal greenish blue or popping red! These 2d Bags have all the fun and practicality together to make it a worth while companion. Use it for school, on the go, or to grab attention… the choice is yours! Just like the older style that we sport, this comes with all the goodness that was loved originally! Designed for college students by college students. 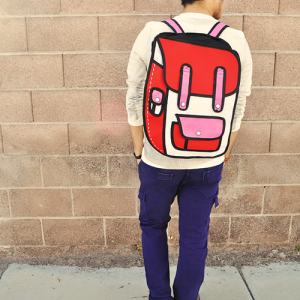 Choose from 4 different colors for this 2D Backpack: Blue, Red, Violet or Pink! This 2D Bag features the following. 5. Improved carrying capability plus a top strap to lug your 2d backpack around!